Japanese Episode AG 110: "Rarutosu o Sukue! Isoge Masato!" American Episode 381: "Do I Hear a Ralts?" While heading toward Rune City, where Satoshi hopes to compete for his eighth Gym Badge, Masato hears the voice of a pokemon calling out in pain. 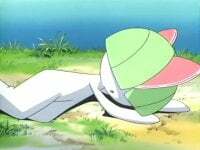 The voice belongs to a Ralts, who appears to have fallen sick and is now unable to take care of itself. Masato takes it upon himself to look after the pokemon, developing a strong bond with the psychic-type in the process. After a while, the Rocket-Dan appear and try to kidnap Ralts to give to their boss, so Satoshi and the others work together to fend the trio off while Masato and Satoshi's Yukiwarashi head for the nearest Pokemon Center. As Masato runs, he comes across a Kirlia and Sirnight. The two pokemon don't trust Masato and begin to attack him, thinking that he's responsible for Ralts' bad condition! The young boy eventually convinces the pokemon that he's a friend, and they allow him to continue his journey as long as he promises to return Ralts to them after it's all better. Ralts is taken to the Pokemon Center, and, after a long wait, the pokemon is released. Now that Ralts is back in good health, Masato realizes that the time to keep his promise has come. As the young boy fights to hold back his tears, he promises that he'll come back someday so that he and Ralts can go on a journey together. As Masato watches, Ralts disappears with the other pokemon, anxiously awaiting the day Masato comes back for it. OK, I'm actually a bit reluctant to give this episode such an honor. I mean, there's plenty of episodes I haven't seen yet, and one of those may actually be good enough to take that title away from this episode. And who knows? Maybe, someday, the anime producers will make an amazing episode that will top this one. But I really doubt it. This episode does so many things right, and it's hard to find an episode that's put together as perfectly as this one. The artwork, the Boss Fantasy (especially Nyasu acting out all the thugs' screams), the Rocket-Dan putting up such a good fight, Kojirou ducking from his Sabonea (it's about time! ), the ending of the episode, the music...it's all done so perfectly that it's almost scary. Of course, we'll probably never see Ralts ever again, but if Masato actually does keep his promise and comes back for it, then this episode will become that much better. The dub version is still awesome, but it's not as awesome as it could have been, and a big part of it has to do with the music used in the dub. If you guys ever get the chance, watch the Japanese version of the scene where everyone's telling Masato to leave the Rocket-Dan to them so he can take Ralts to the Pokemon Center. Or the big farewell scene at the end. I mean, I guess the dub does an alright job of keeping in a lot of the emotion of these scenes, but the Japanese version is just so much more powerful. In the Japanese version, the lyrics to Glory Day are changed as of this episode. I like version two's lyrics better, for some reason. Two seconds are removed from the episode's title screen. Then, the shot of Masato's feet that directly follows the title screen is shortened by a second. I don't know if it's just me, but it sounds like the sound effect that goes with Sabonea's new Pin Missile animation has been turned WAY down in the dub, almost to the point where you can't hear it. Originally the sound of the missiles hitting the ground were much louder. The wide shot of Masato crying during the "let's rip off the berry scene from the Celebi movie" scene is shortened by two seconds. I'd also like to point out that Amy Birnbaum does a pretty good job crying here. I'm glad she's not still using that Max voice she used way back in the beginning of the series (compare her performance in "There's No Place Like Hoenn" to some of the more recent episodes), because if she was, this scene wouldn't be nearly as effective. So during that montage where Masato is running toward the Pokemon Center, Smile, the third ending theme to Advanced Generation, is playing in the background in the Japanese version. Of course, this Japanese song is eliminated in the dub. However, 4Kids actually goes the extra mile here and replaces the Japanese song with a brand new song which seems to have been made specifically for this episode. Now I'm not too fond of the new song since it sounds like one of those bad 80's hairband ballads that drunk businessmen sing on karaoke night, but I'm not too upset since I think Smile's a bit overrated as far as Pocket Monsters songs go.